My little adventure outside the UK, on the Isle of Man, didn’t last long. Douglas, the main town, is a nice enough place; a very traditional (Old-fashioned? Yes, definitely old-fashioned) seaside resort. Terraces of Victorian hotels, a promenade, horse-drawn trams, and shops that shut at five sharp in the evening. I wasn’t really on the Isle of Man for its genteel touristic charms, however. Or its exceptionally low rates of income tax. There are two things which move a little quicker than the trams, and rank alongside offshore finances as the island’s best-known features. The first (and slower) of these are some of the finest racing cyclists in the world. Mark Cavendish and Pete Kennaugh are the current cream of the Manx crop. I thought it would be good to have a little ride around some of the roads they grew up on. The other fast thing is the Isle of Man TT. Also on two wheels, but just a little quicker. If you’ve not seen what motorbikes look like while doing 200 mph on public roads, this video gives you an idea. I thought it would be good to see how the Beastlet matched up. 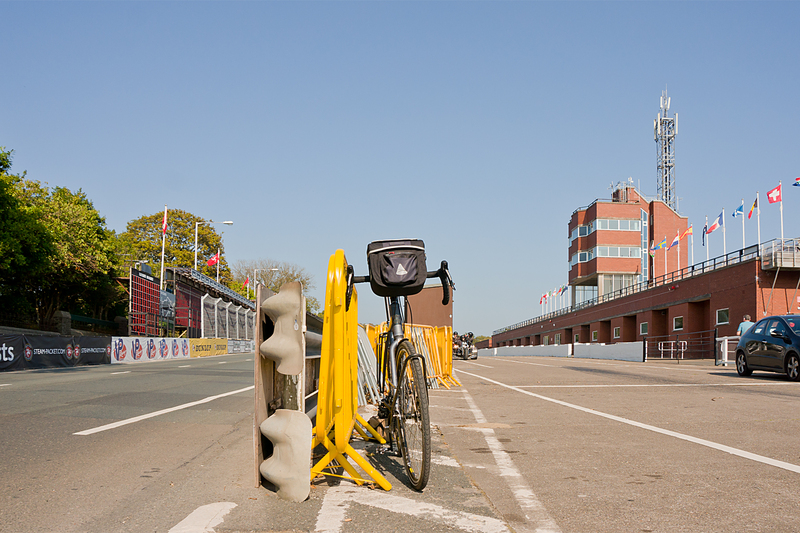 I took most of the bags off, and rode up to the top of the TT’s Mountain course (from where the picture above was taken). It was surprisingly easy, having dropped 20 kilos of weight. And, having admired the view, I turned around and legged it back down the 400 vertical metres to the TT finishing line as fast as my tiny touring chainrings would allow. My legs were a blur. It only took about 15 minutes to pile down the hill. Which was somewhat quicker than the climb up. I was quite pleased, as there was a bit of traffic. 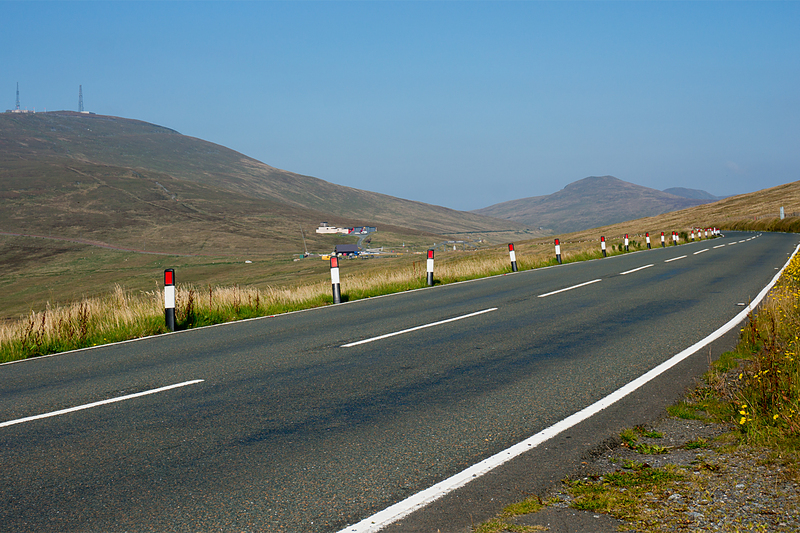 But the fastest TT riders are close to 17 minutes for the whole 38-mile lap of the island. Read that again. 17 minutes for 38 miles. Hairpin bends, mountain roads, mini-roundabouts and all. An average speed of over 132 miles an hour (210 kph), and a max 0f 200 mph. Phew! It’s fair to say that I’m unlikely to match that sort of speed pedalling. And putting engines on bikes is cheating, anyway. So I reluctantly shelved my racing dreams, had an early night, and awoke in darkness to catch the early boat to Northern Ireland. I’ve been to the Republic of Ireland loads of times, but never been to the North before. I guess it’s the same for lots of people my age, as Northern Ireland was, to say the very least, a bit of a mess for most of my life. It’s a part of the UK which is still struggling with its past issues (to the extent that half the Assembly resigned while I was there). The armoured police stations with their high fences, watchtowers and cameras are a reminder of the bad old days. And there are echoes of that past all over the place. 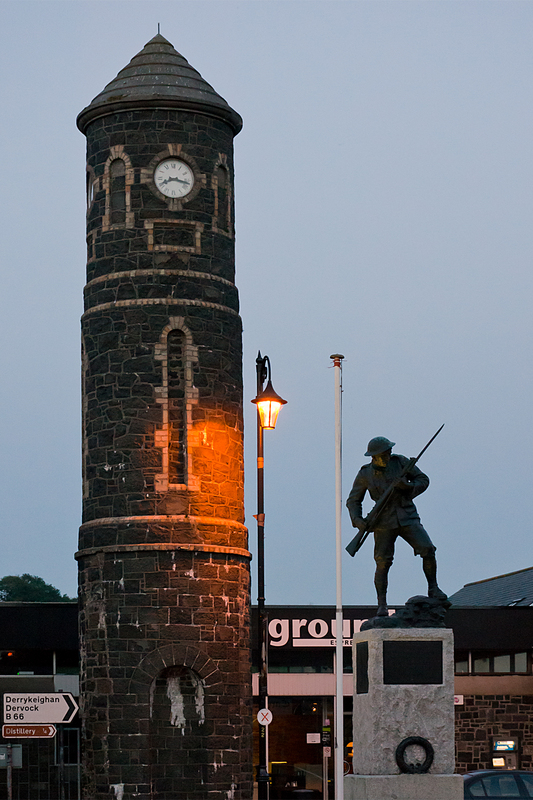 I saw more Union Flags in Northern Ireland than I have anywhere else in the UK, together with red, white and blue painted kerbstones, and war memorials to members of the British army (like the one in Bushmills, below). There’s not much doubt that people in these areas see themselves as being part of the UK very strongly. In areas and villages where there were no flags, the school names tended to begin with ‘Saint’, there were Irish Gaelic translations of the road names (add that to the list of languages in the UK), and the kerb stones remained unpainted. But things are much, much better than they used to be. The main terrorist / paramilitary (as usual, it depends on whether they’re on your side or not) groups on both sides aren’t bombing and shooting each other, or the army and police, any more. I met a local cyclist called Des, who rode with me up a big chunk of a big hill, taking the edge off the gradient and the brutal headwind. It was a classified climb when the Tour of Italy started in Northern Ireland a couple of years ago, which was some consolation. Des was around my age, and had grown up with one Catholic and one Protestant parent (I can’t remember which was which). He told me that his kids don’t believe him when he tells them how things were when he was growing up. That can only be a good thing. 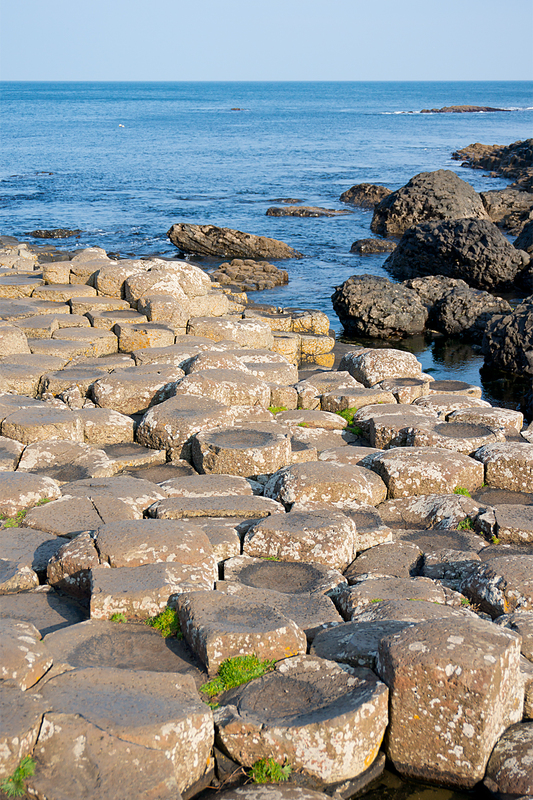 And I hope it stays that way, because Northern Ireland is stunning. 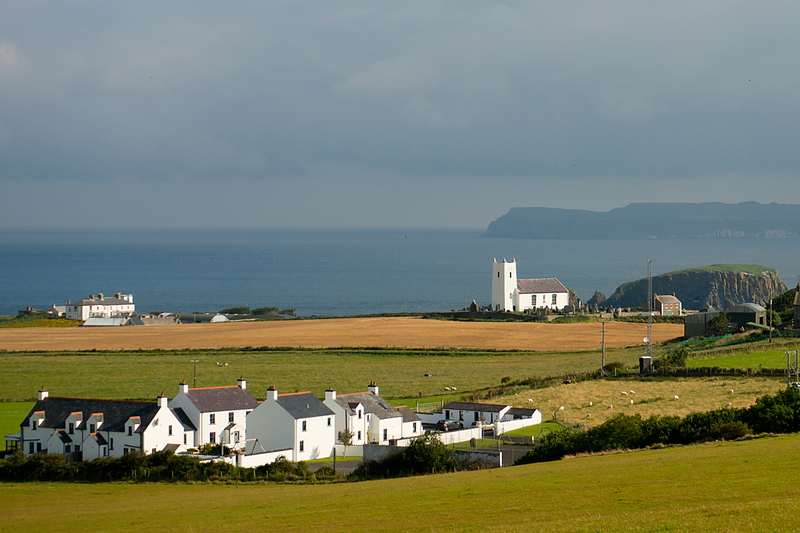 Having spent Wednesday riding up to the north coast from Belfast through rolling farm country, Thursday was spent on the hills and coast of County Antrim. 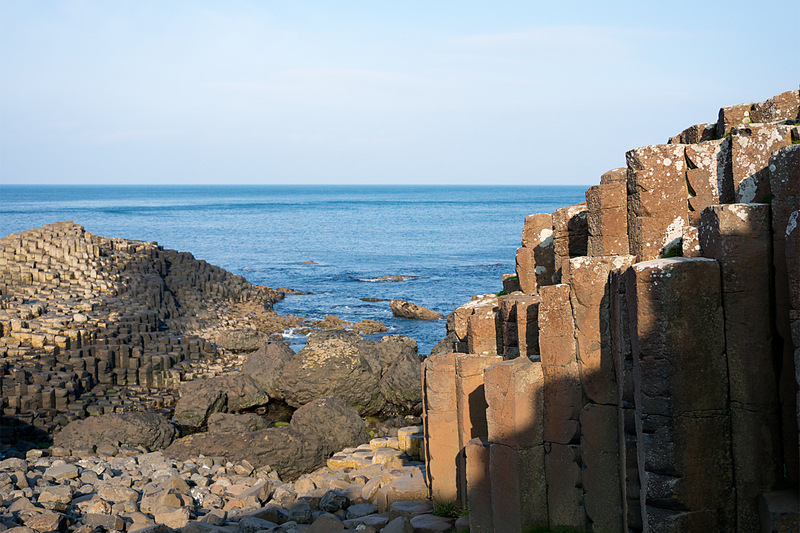 First stop was the Giant’s Causeway, which is one of the very few places on earth where nature creates straight lines. It’s actually quite hard to get your head around the fact that it’s not man-made (it’s much easier to understand that it wasn’t actually made by a giant, but don’t tell the kids). And I managed to get ahead of the tourist hordes, which means that the pictures aren’t full of hiking jackets, which they would have been ten minutes later. 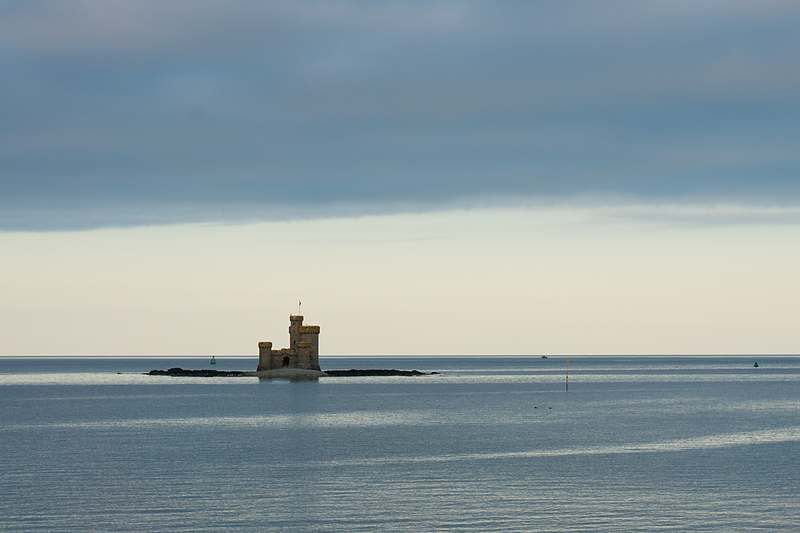 The Antrim coast is beautiful all the way down to the port at Larne, where I was headed to get the boat to Scotland. It was a hard day’s ride, with a 20 to 30 mph headwind raking the exposed coast once I’d got over the big hills in the morning. But I wasn’t in a rush, thankfully, so could take plenty of breaks to soak up the scenery; bays and islands to the left, the glens of Antrim away to the right. Lovely. I’d highly recommend Northern Ireland on a bike, and I met quite a few tourers on the roads over there. It’s a beautiful place, there are stacks of sights to see, enough hostels and campsites around, and the roads are much like the Republic of Ireland; small and quiet. It’s hilly and windy, but that’s par for the course in the British Isles in general. Another start in the dark, and a slightly spooky pedal through the silent streets of Larne, dropped me down to the ferry for the mainland yesterday morning. The wind was high by six-thirty (high enough that it managed to blow the bike and bags over when I parked against the fence at the terminal), but it would be pushing me up through Scotland, once I got across the water. Two hours on the boat, and I arrived into the tiny port of Cairnryan. 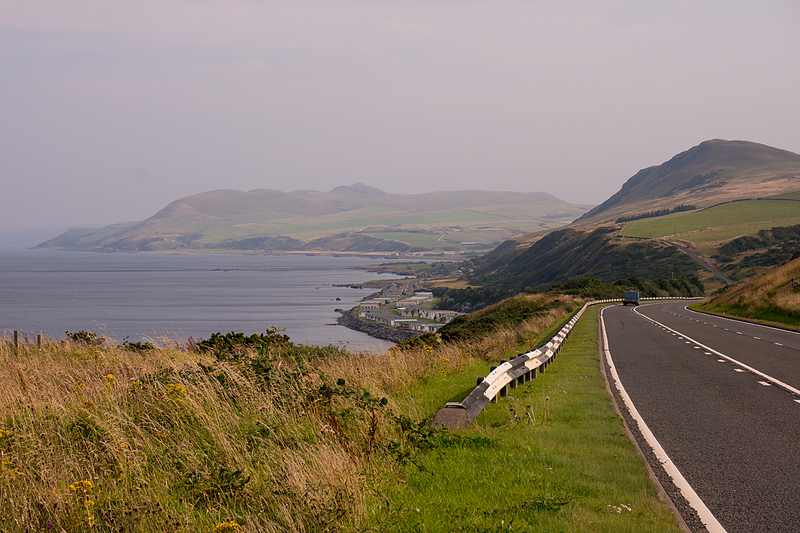 Into Scotland, the fourth and last of my UK countries-within-a-country. And I’m still slightly astonished that I’ve crossed all those borders without showing ID once. This is Robert Burns country; Scotland’s favourite writer (and national hero) was born and died in Ayrshire and Dumfries, and I passed through both areas on the way north. Which brings me to another British linguistic quirk. Burns wrote mainly in Scots, but I’m not sure whether it counts as my fifth UK language (I’m disregarding Manx, as the Isle of Man is not in the UK). But is it a language or a dialect? Nobody seems to know. 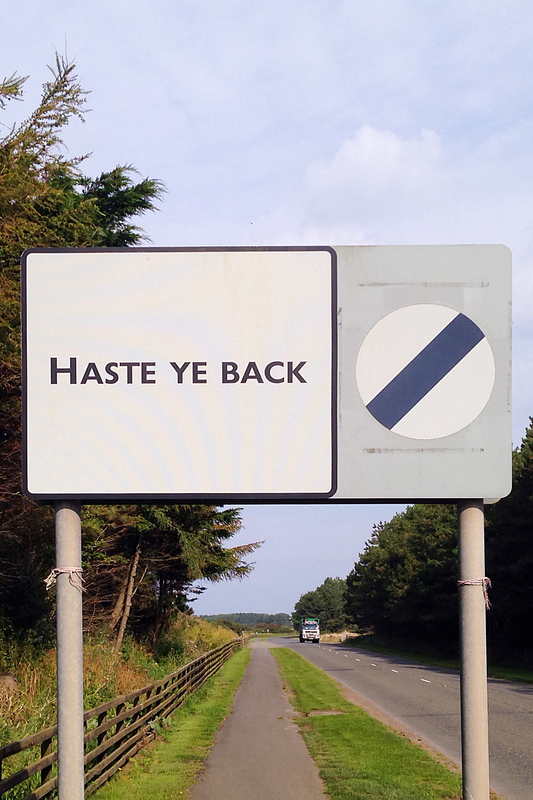 If you speak English, it’s not hard to work out that the sign above means ‘Come Back Soon’. Although a really strong Scots accent can be hard to decipher for an English person. It’s not an official language (unlike Scots Gaelic, which should pop up as I go further north), and most Scottish people don’t think of it as a language. Even those who identify as Scots speakers. But it is recognised as a ‘traditional’ language by both the Scottish and Northern Irish governments*. Once again, it’s all as clear as mud. One thing that’s definitely true of Scotland, especially in the west, is that it gets a lot of rain. It’s been hammering down all morning, and after a few hard days in the saddle, and passing the 1000 km mark on the bike, I’ve decided that another rest day is in order today (Saturday). With a bit of luck, the next few days will be dodging showers, rather than getting soaked, as I pass Glasgow and head on north. Mountains, lochs, valleys and the mysteries of Loch Ness to come, before I even get to the capital of the Highlands at Inverness.